Huge tsunamis were generated by the 2011 off the Pacific coast of Tohoku Earthquake that occurred on March 11, 2011. This natural disaster caused unprecedented damage to an approximately 700km of areas on the Pacific coast. Satellite remote sensing plays an effective role to quickly put the whole picture of the tsunami damages. In this paper, we introduce an example of quasi-real-time analyses of the tsunami disaster situation using multiple satellite images. Shortly after the earthquake, wide observational range satellites, Terra/MODIS and RADARSAT-2 images, were utilized to grasp the situation of the disaster-affected areas. Terra/MODIS, which is an optical sensor that can be influenced by weather conditions, observed an image that includes only a small cloud cover on March 14. Analysis was completed within two days, and wide flooded area maps that cover areas from Iwate to Fukushima Prefecture were offered on March 16 (Fig.1). 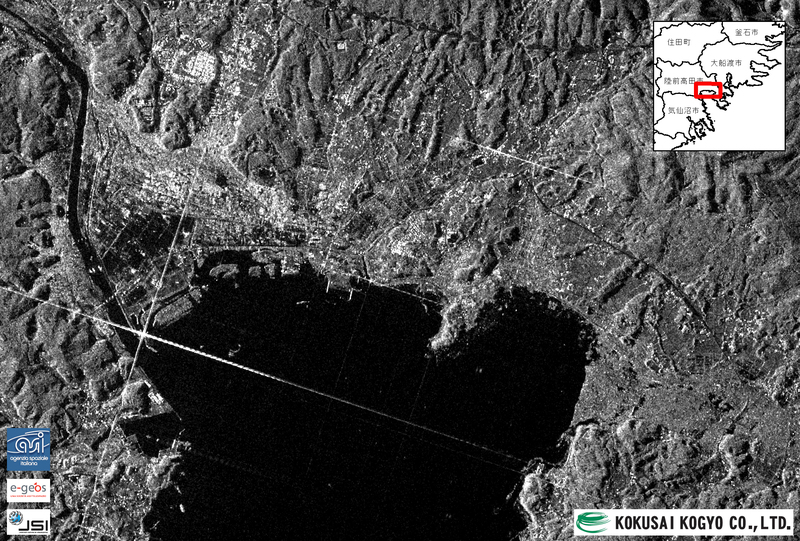 RADARSAT-2, which is a SAR sensor that is unaffected by weather conditions, observed an image on March 13. It took several days to analyze and interpret the RADARSAT-2 image, and flooded area maps that cover areas from Miyagi to Ibaraki Prefecture were offered on March 19 (Fig.2). High resolution satellite was useful to conduct detailed surveys about damages of specified areas. 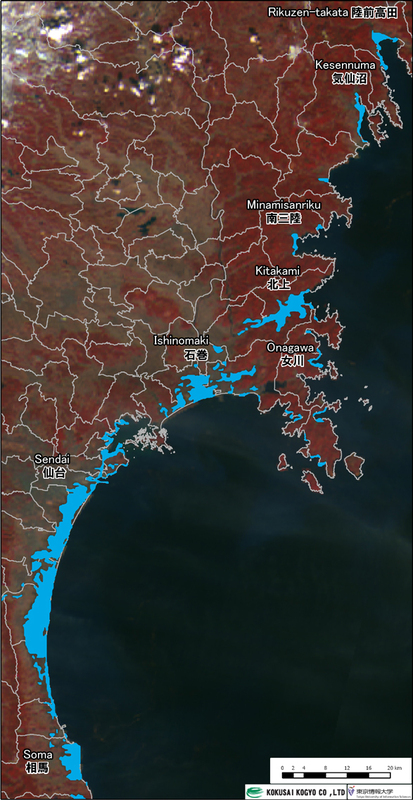 A flooded area map of areas around Soma City in Fukushima Prefecture was created by the interpretation of IKONOS image (optical image, 1m resolution) observed on March 12, and then offered on March 13 (Fig.3). 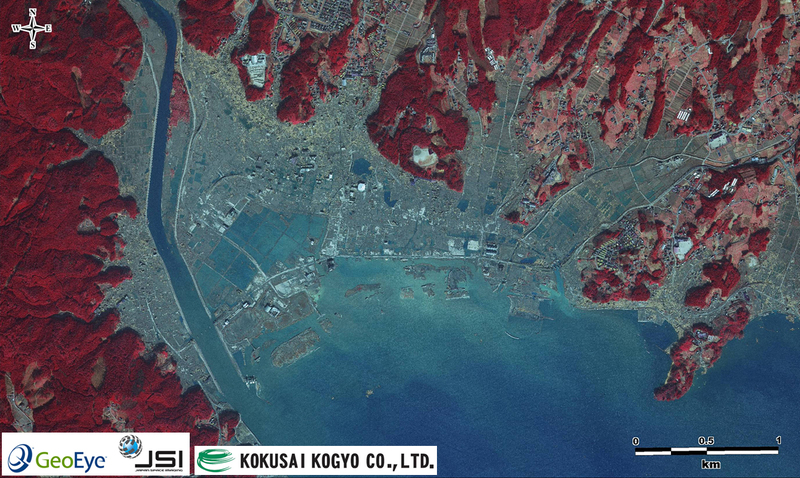 For areas around Rikuzen-takata City in Iwate Prefecture, GeoEye-1 image (optical image, 50cm resolution) and COSMO-SkyMed image (SAR image, 3m resolution) were observed on March 12 and 13 respectively. 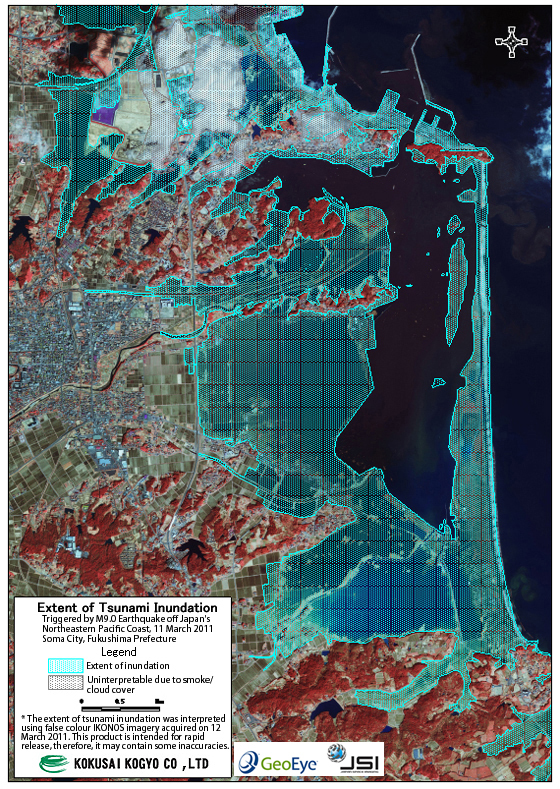 The use of these satellite data enabled for grasping detailed situation of damages, such as flooded areas, damaged areas of the tsunamis, landscape changes, and damages to structures (Fig.4 and Fig.5). The GeoEye-1 image was also useful to conduct rubble extraction (Fig.6). 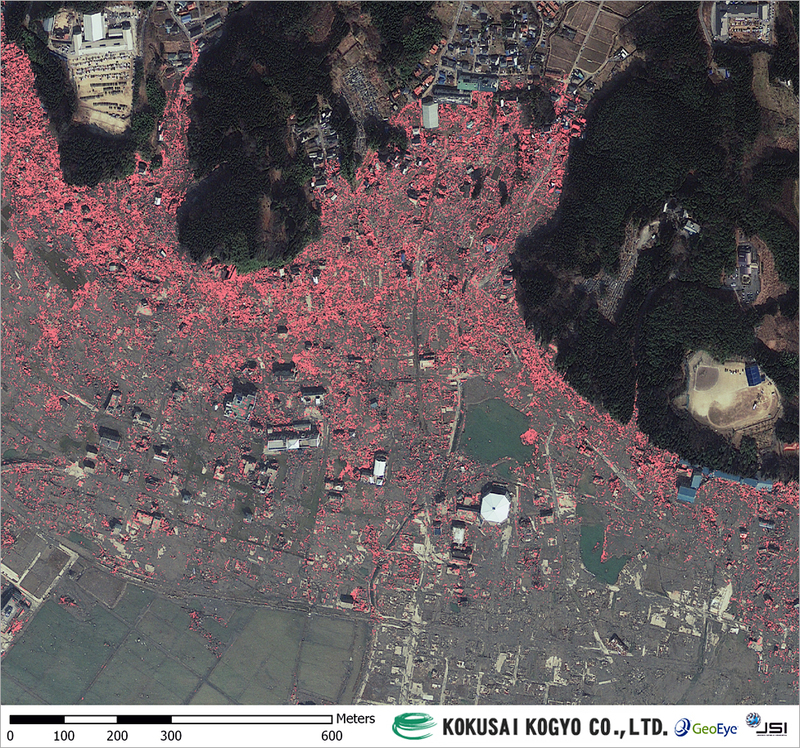 Approximately three months have passed since the earthquake disaster occurred, and the grasping initial damages using the satellite images have almost completed. At present, the basis for developing reconstruction plans are increasingly required, and we deal with requests from concerned institutions, such as surveys about damaged littoral forests (Fig.7). 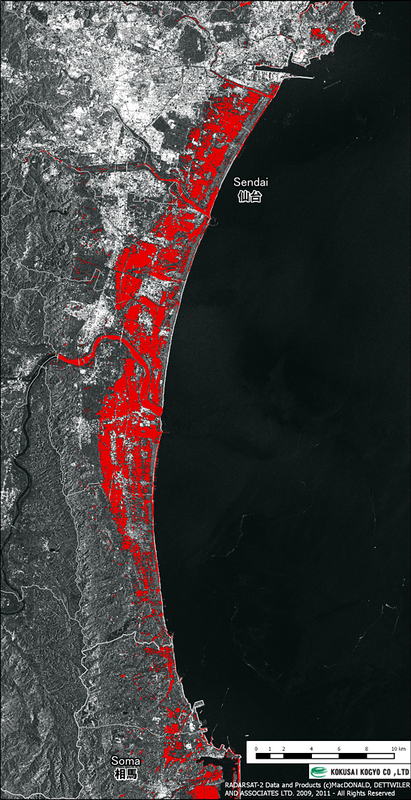 We want to contribute to the reconstruction of disaster-affected areas by providing analytical results using satellite remote sensing techniques.